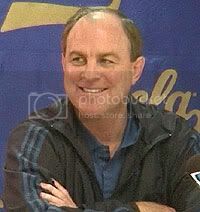 At his weekly press conference on Tuesday, UCLA Coach Ben Howland said the Bruin's defense needed to improve from where it is presently. Although the team is allowing just 64.0 points a contest in Pac-10 play, opponents are shooting over 45% against them. "We’re not getting enough stops," Howland said "When you allow your opponent to shoot 45% that’s not low enough. We’re actually doing a good job on the offensive end, if you look at our field-goal percentage." One immediate fix for the defense would be the return of forward Luc Richard Mbah a Moute, one of the team's best defensive players and rebounders. He is still listed as probable for Sunday's rematch against USC. Mbah a Moute missed the last two games due to a sprained ankle he suffered against Arizona on February 2. "He did some shooting yesterday, but not any cutting," Howland said. "It was just stationary - one spot. Obviously, he’s got to do some more conditioning, but we’ll see after what he does today. He’ll do some stuff individually today." His ankle injury followed a concussion he suffered two weeks ago that literally knocked him out of the Trojan game at Pauley Pavilion and the following road trip to Oregon. UCLA could use a healthy Mbah a Moute on Sunday to help defend against USC's Davon Jefferson who scored 25 points to help upset the Bruins in their first meeting. Injured junior Michael Roll has not played since Dec. 29 against UC Davis and is still not ready to rejoin the team, and its uncertain if he will return at all this season. Roll ruptured the plantar fascia in his foot and has been sidelined since the injury. Coach Howland said he has no plans to red-shirt Roll at this point but will have no choice if Roll misses the remainder of the season. The 6'5 guard from Laguna Niguel was averaging 2.8 points and 2.3 assists in 15.5 minutes a game before his injury. Coach Howland said he has not spoken to a Pac-10 officials about the incident where Husky guard Tim Morris threw the ball into Alfred Aboya's face while attempting to inbound the ball towards the end of the game to avoid a five second violation.